Home / Blog / Outdoor Umbrellas / Ashadya makes Buying Commercial Umbrellas in Sydney easy! Published: December 5th, 2018 by admin. Filed in Outdoor Umbrellas and tagged Buying Guide, Commercial Umbrellas, outdoor umbrellas. It’s no surprise that commercial umbrellas are fairly popular here in Sydney. Not only are they widely used across restaurants, cafes and other businesses, but they are also becoming the shade solution of choice for Sydney homeowners. As the owner of Ashadya Shade Sails & Blinds, a company that specialises in offering commercial umbrellas in Sydney, let me tell you that buying a commercial umbrella is very easy. Today, I will outline the steps you need to follow to purchase one of our commercial umbrellas. When you’re done reading, you’ll understand what I mean when I say we make buying commercial umbrellas in Sydney easy! The first step in purchasing one of our commercial umbrellas in Sydney is to choose the umbrella canopy shape. Ashadya commercial umbrellas come in octagonal and square shapes for you to choose. Simply decide which shape will suit your space better and then move on to selecting the umbrella size. Once you’ve chosen a shape, next choose an umbrella size according to the space you want to shade. Our octagonal commercial umbrellas are available in 6 size options ranging from 3.5m-6.0m, while our square commercial umbrellas come in 5 size options ranging from 3.0m-4.8m. After you’ve chosen the umbrella size and shape, the next thing you need to do is to choose a shade fabric. With Ashadya commercial umbrellas in Sydney, you’ll get of choice of industry-leading shade cloth fabrics. These include the acrylic canvas fabric or the Ferrari 502 PVC coated fabric. While our acrylic canvas fabric is water resistant, the Ferrari 502 PVC coated fabric is completely waterproof. Both fabrics offer excellent sun protection. Depending on whether you plan to leave your umbrella out all the time or not, choose a shade cloth fabric accordingly. After you’ve selected a shade cloth fabric of your choice, the next thing you need to do is to choose a colour from that range. While our acrylic canvas fabric comes in a choice of 14 designer colours, the Ferrari 502 PVC coated fabric comes in a choice of 18 designer colours. Consider your landscaping, the colour of your home and your décor and choose a fabric colour accordingly. The final step in purchasing our commercial umbrellas in Sydney is to choose a frame colour. The powder-coated aluminium frame of our commercial umbrellas is available in 10 colour choices. Now all you have to do is call Ashadya Shade Sails & Blinds and let us know your requirements. You can then relax and leave the rest up to us! Your commercial umbrella will then be manufactured to your exact requirements. And, if you wish to accessorise umbrellas, we can also add clear PVC side curtains and umbrella gutters or carry out special screen printing on our commercial umbrellas. Rest assured that Ashadya’s commercial umbrellas are superior grade products that are built to last. This is evident in the manufacturer’s warranties, which back both the umbrella frame as well as the shade cloth fabric. With us around, you needn’t look elsewhere for commercial umbrellas. 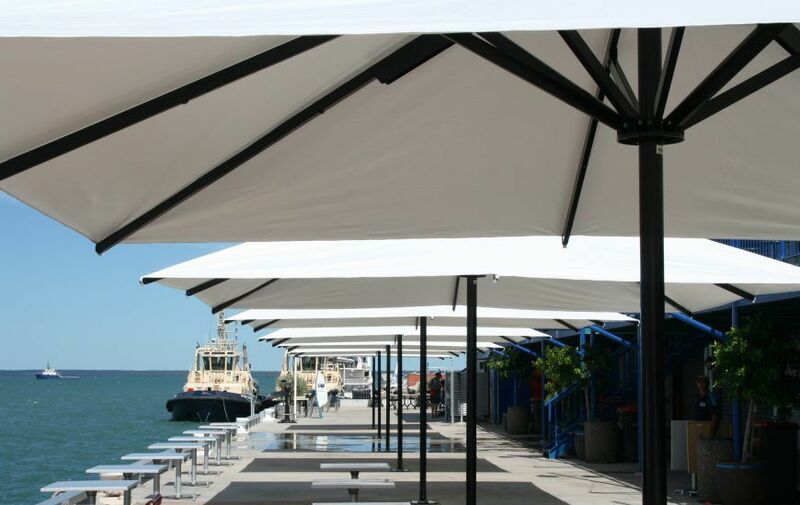 Ashadya Shade Sails & Blinds makes purchasing commercial umbrellas in Sydney ridiculously simple. All you need to do is to choose a shape for your umbrella, choose a size, choose the fabric, choose a fabric colour, choose a frame colour and any accessories you may need. Once you’ve done these, your outdoor umbrella will be custom manufactured for you. Buying commercial umbrellas cannot be made any simpler. To discuss your requirements for commercial umbrellas in Sydney, call us at 1300 570 907 today!